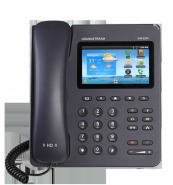 The GXP2200 is one of the most advanced AndroidTM desktop IP phones available on the market today. The innovative phone includes the AndroidTM version 2.3 operating system with a 4.3 inch capacitive touchscreen LCD and the ability to host 6 SIP accounts. Web applications such as news, social media sites, and games can be downloaded directly via Google Play Store. Applications can be created to fit any requirement and downloaded directly to the phone for customized use. • call history with up to 500 records. audio HD de bande large, haut-parleurs mains libres plein-duplex avec annulation d'écho acoustique avanceé et performance de double-parler.